Do you like rollercoasters? 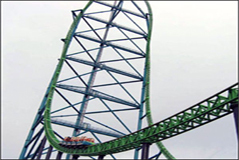 456 feet in the air, 128 miles per hour, the ride last only seconds. Life is like a rollercoaster. If you really want to get the fullest experience, when you get to the top you have to let go. You have to put your hands up in the sky and let go and embrace the fear. Riding a rollercoaster is really just symbolic what I'm really talking about is letting go in life, taking chances. Is the hardest thing letting go or is the hardest thing believing that the fall won't be fatal?